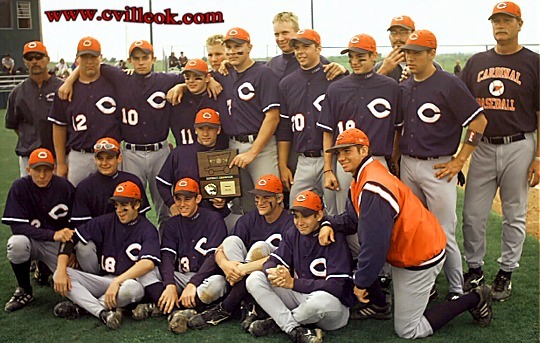 2004 District Champs (Class 4A) -- Collinsville Cardinal Baseball Team (Left to Right) Back Row: Coach Tony Reeder, Ryan Coe (12), Jimmy West (10), Cody Brown (11). Jason Scott (14), Josh Compton (7), David Chester (15), Tyler Whitaker (20), Tyler Nair (19), Coach Damon Herald, Jesse Bugg (6) and Coach Phil Davis. Front Row: Cory Flynn (2), Kyle Shults (4), Brad Aguillard (18), Chris Treibt (13), Chad Ausmus (1) with plaque, Ricky Rimpley (9), Jonathan Bewley (16) and Shane Statum (3). An ackward start with a great finish! -- David Chester crashes over first base in a half dive / half fall but he beat the throw and was safe in the 2nd inning with 2 already out. 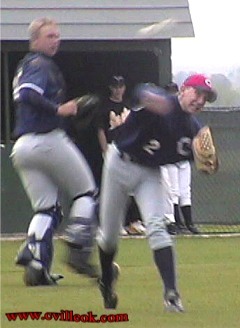 This play started a 9-run 2-out offensive outburst. Chad Ausmus followed with a single. Chris Treibt reached on a error loading the bases. Kyle Shults' double scored the first two runs. 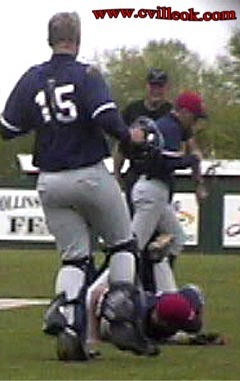 Ricky Rimpley's single brought in another run. Jesse Bugg was intentionally walked. 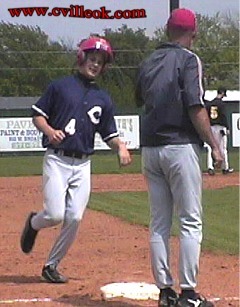 Josh Compton drew a walk scoring another run. Jason Scott's single scored two runs. A single by Tyler Whitaker brought in another run. David Chester's second single of the inning scored 2 to put the Cards up 9-0. This Kyle Shults two-run homer in the 4th inning brought in the final runs in the 14-1 win for the Cards in the 3-game series with Inola. 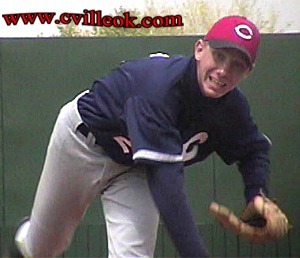 Cory Flynn handled all the pitching duties for Collinsville Thursday, picking up a big win. Josh Compton came up big defensively in the 4th inning robbing Inola by stabbing a hard liner down the first base line for the 2nd out. 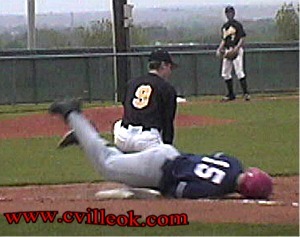 Josh then made a diving catch (above) on a foul popup for the 3rd out. 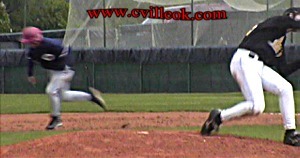 Cory Flynn throws out a runner at first in the 5th inning.